Samsung on Tuesday moved forward with arguments in its case against Apple, going on the offensive by alleging the iPhone maker infringed on three patents regarding the usability of multi-feature portable devices like smartphones. Harvard professor and patent specialist Woodward Yang, was called to the stand as Samsung's fourth witness, gave testimony regarding three patents owned by the South Korean company covering photos, email attachments and playing music in the background. According to in-court reports from CNET, Yang claims to have spent some 300 to 400 hours researching Apple devices for trial purposes, alleging certain models of the iPhone, iPad and iPod touch infringe on Samsung's patents. 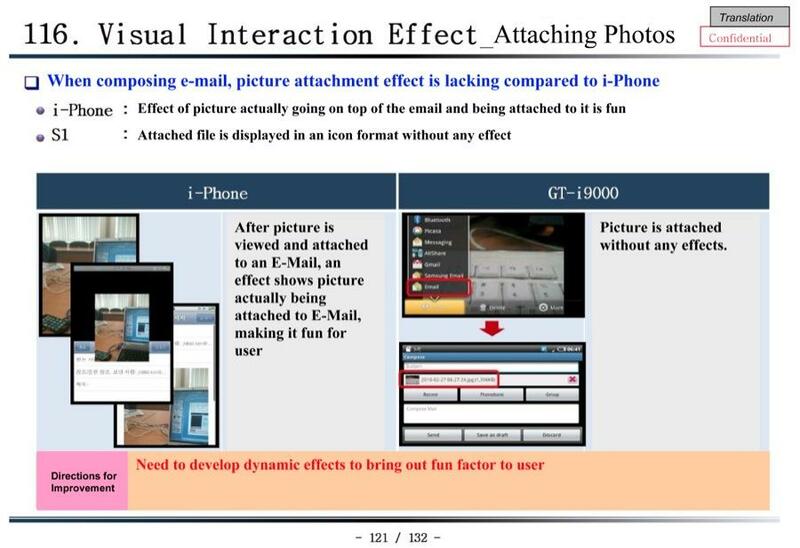 During his testimony, Yang demoed a photo emailing patent by showing Apple's iDevices sending pictures taken of an orange. According to the witness, the invention was designed with feature phones in mind, doing away with the hassle of connecting the device to a computer to offload photos. It is unclear if the patent covers Apple's integrated photo sharing options. In another photo-related patent claim, Samsung asserted a photo album patent where a user can bookmark a specific photo for later viewing. Yang demoed the allegedly infringed feature on the iPhone 3GS, iPhone 4, iPad 2 and fourth-generation iPod touch, all of which presented the same image when bringing up a photo roll in an app other than Apple's default Photos. Finally, Samsung asserted a patent which describes a software solution for music to be played in the background behind other open apps. Yang notes the idea for the claim was to find a way to keep music playing when switching through apps, while keeping device size down by not introducing decoding hardware. In cross-examination, Apple lawyer Bill Lee went on the offensive, referencing a page from Samsung's side-by-side comparison of the iPhone and what would would become the Galaxy S, saying the Korean company studied Apple's implementation of email attachments. "In your 400 hours of work, you have not found one iota of evidence that Apple knew about the '893 patent, or copied the '893 patent," Lee said in reference to the photo album feature. Yang said the assertion was true. The Apple lawyer noted that none of the patent inventors testified in Samsung's defense, nor does the company use any of the asserted properties in its smartphones. Lee asked Yang how Apple could have copied the features if they weren't present on Samsung devices. Yang was the third Samsung witness to take the stand on Tuesday, following Adam Bogue and Clifton Forlines, both of whom were involved with Mitsubishi Electric Research Laboratories' DiamondTouch table. Judge angered by continued Apple, Samsung courtroom "theatrics"